The rarest and most traveled $2 bill on the planet, which also holds the world's speed record for a manned vehicle flight! This is one impressive bill. On May 18, 1969, Apollo 10 lifted off from Cape Kennedy Florida for the final dress rehearsal mission before the historic Apollo 11 lunar landing. Tom Stafford, John Young, and Gene Cernan flew the mission. This would be Gene Cernan's second space flight, and along with him, he took his lucky $2 bill --- the one that flew with him on Gemini 9A. The bill was given to him by his father for good luck, and before Gene could give it back to him, his father, unfortunately, passed away. The fact that this bill has flown 3x in space, makes it one of the rarest and most unique $2 bills on (or off!) the planet. Fun Fact: this bill has also traveled at the fastest speed ever recorded for human flight, a record held by Apollo 10 during re-entry that has never been broken -- 24,791 m.p.h. (39,897 km/h)! It is one of the rarest $2 bills on (or off!) 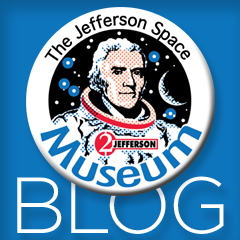 the planet, and it is one of the many treasured bills that reside within the Jefferson Space Museum collection. Captain Eugene Cernan, in his Houston office, flight certifying this bill from his collection, and attesting to its history.